Fiji is a cluster of 333 tropical islands and is home to almost 1 million of the happiest, friendliest people on Earth! 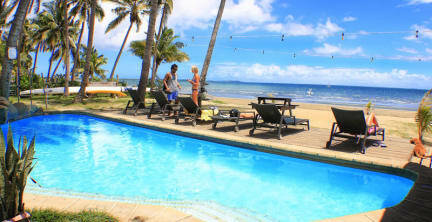 Bamboo is Beautiful Fiji's fun, friendly and atmospheric budget traveller base. Located within a cluster of cool hostels in the midst of Nadi's Backpacker Beach, it’s an ideal spot to stay to acclimatise, meet people, craft travel plans, and then launch out to some islands! Relax under a huge traditional Fijian thatch hut, swim and play down the sandy stretch of Wailoaloa Beach, swing in a hammock and enjoy the tropical surroundings. - Delicious, cheap food available 24/7 at 'Cafe BAMBOO', featuring daily specials and traditional Fijian cuisine. - An island-style beach bar with double happy hour, sunset cocktails and open late. The Bamboo travel team can help to plan and reserve trips to beautiful spots at backpacker prices. Free transfers depart from BAMBOO daily for Awesome Adventures, Feejee Experience, Captain Cook Cruises and the Mamanuca Backpacker Boat. Local buses also stop outside throughout the day. Bamboo were brilliant for our first night in Nadi, with airport pick up and a travel desk they helped us out massively in terms of organising our island trip. Lovely cafe of food and a pool and right on the beach. Very good price for what we got definitely! Good cheap food at the restaurant, beds are comfy at blue water lodge. Staff was very friendly:) Maria was a beautiful face to greet you on arrival and very friendly. I was then shown to my room and given a quick tour of the facilities. The door was a little tight but cozy and the beds were very comfortable. I stayed in the 6 room dorm. The hostel is a bit out of town but a great location to start your trip to the yasawas and the bus picks you right up to catch your boat from port Denerau. Great atmosphere for the price. Would definitely recommend. Vinaka! I was literally here for the night before a flight so a very brief stay. Little wooden capsule style beds which give a bit of privacy in the 6 person dorm and a/c. WiFi reaches to the dorm. The shared bathroom is probably in need of a bit if renovation but fine if you're not fussy. Busy bar/restaurant that put on traditional style dance entertainment in the evening. Close to the airport and port for trips to the islands. Good hostel. Decent sized rooms with comfy beds. Very friendly staff. I would have enjoyed my stat if it wasnt for the music blasting out from the bar until 1am. In fairness they did turn it down when asked (for about 20 mins) - not ideal when you have an early start to catch the ferry! Bamboo staff went out of their way to be welcoming and help us with many different things outside the scooe of their normal duties. Great value for money, would recommend to travelers first arriving as you can be picked up directly from airport. Nice stop for short stay and trip planning, great chilling atmosphere aside the beach.